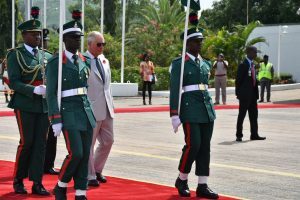 Prince of Wales, Prince Charles Philip Arthur George of United Kingdom arrived Nigeria on a three-day business and cultural tour today, Tuesday, November 6, 2018. Travelling aboard a Boeing 737, Royal Aircraft emblazoned in the Union Jack, (the British flag) he touched down at the Presidential Wing of the Dr. Nnamdi Azikiwe International Airport, Abuja at exactly 13.25 hours Nigerian Local time. Upon arrival, Prince Charles was received by the Federal Capital Territory (FCT) Minister, Malam Muhammad Musa Bello and the Minister of State Foreign Affairs, Hajia Khadijah Bukar Abba. The British Royal is visiting Nigeria for the first time since 2006. But for his wife, Camilla, the Duchess of Cornwall this visit is her first. Another element of the trip would be effort to build peace in the middle belt of Nigeria. 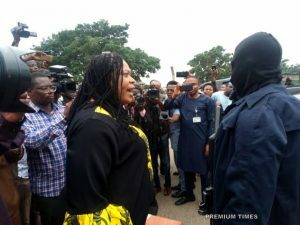 A peace round table would be held in Abuja rather than Jos and many representatives of the communities in the middle belt would be coming to Abuja. Other component of the trip include culture, youth, women, business, and arts among others. There is an environmental element in which the prince would visit a botanical garden, something the Prince is passionate about. The British government, he revealed, has been providing military support to Nigeria in the effort to stem the insurgency in the North East through training, supply of arms and intelligence. He stated that the visit of the Prince of Wales is coming at the backdrop of the recent visit of the Prime Minister of Great Britain, Theresa May, two months ago, during which she signed security and defense pact with Nigeria. The British aid agency, DFID, the High Commissioner noted has also been in the forefront of providing assistance to rural women, helping them with livestock, vaccination, and capacity building, to ensure their survival and increase in size.